It is clear that food production and agriculture need to be a large part of the discussion in realizing the world’s main objectives for the future. Recognizing this, the Global Environment Facility (GEF) and FAO, as an implementing agency, address the critical nexus of agriculture and the environment. We can’t really talk about the planet’s most pressing environmental problems without talking about food systems. And by food systems, we also mean the agriculture that it takes to support them: farming, fisheries, forestry and the value chains that provide food and fiber for our daily lives. Agriculture uses 70 percent of all fresh water withdrawal and contributes nearly 30 percent (including off-farm) of global greenhouse gas emissions. Food production is also responsible for 75 percent of agrobiodiversity loss. This is already true now and by 2050, the world will need 50 percent more food to feed a population of over 9.7 billion, a population which will be more urbanized, affluent and demanding in its food choices. Our natural resources are already under pressure. Yet, 815 million people are hungry, and 2 billion people suffer from micronutrient deficiencies. It is clear that food production and agriculture need to be a large part of the discussion in realizing the world’s main objectives for the future, i.e. the Sustainable Development Goals. Recognizing this, the Global Environment Facility (GEF) and FAO, as an implementing agency, address the critical nexus of agriculture and the environment. Through 187 projects in over 120 countries, FAO-GEF projects have tackled issues like climate change, biodiversity, land degradation, safe disposal of hazardous chemicals and management of international waters. Traditionally, FAO and the GEF have worked together to help smallholder producers improve production practices in ways that also generate global environmental results, but the partnership is increasingly focusing on the entire value chain. Rural people produce three-quarters of the world's food yet these same people constitute 80 percent of the global poor. Most do not have the means to change their farming practices on their own. One of the biggest areas of work for FAO and GEF is helping farmers to cope with the changes in climate and become resilient to them. Worldwide, rainfall is increasingly less predictable and storms and natural disasters are more frequent. Temperatures aren’t stable and seasons don’t come when they are supposed to. In Mali, these realities are extreme. As a country whose rainfall has never been reliable, Mali has also been increasingly prone to drought in the last 50 years. Continued trends of increased temperatures and decreased rainfall could be devastating to Mali’s major food crops, such as millet, sorghum, rice and maize, not to mention, problematic for livestock, the country’s second most important export commodity. A GEF-funded project focused on helping over 40,000 smallholder farmers to diversify production, improve soil health and fertility and choose seeds and varieties more tolerant to varied temperature and rainfall. These actions have helped increase yields by 21 to 77 percent for sorghum, millet, rice, corn, sesame and cotton. In the Bay of Bengal, an area that spans eight countries (Bangladesh, India, Indonesia, Malaysia, Maldives, Myanmar, Sri Lanka and Thailand), 400 million people live at or below the poverty line. They are dependent on the Bay for their food and livelihoods. 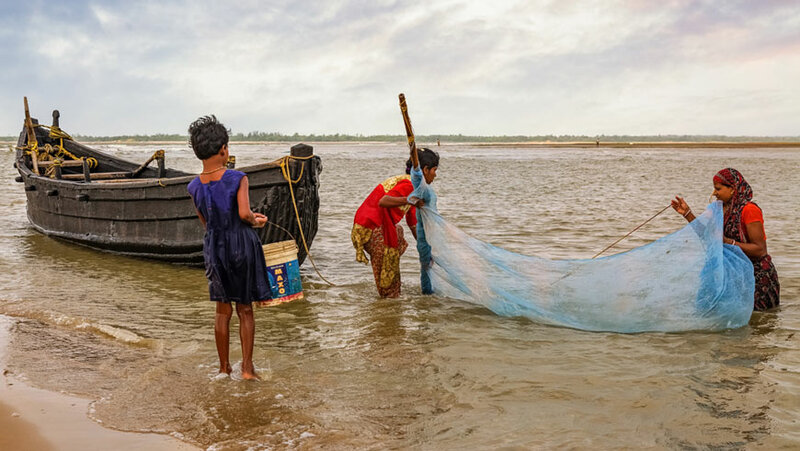 Yet, the continuing degradation of the Bay of Bengal’s marine resources is severely impacting the quality of life and the economic potential in these coastal communities. A FAO-GEF project was implemented to enhance the regional management of the area’s environment and fisheries sector by tackling issues such as restoration, marine pollution and habitat conservation. Transboundary marine resources are particularly complex as there are a broad range of stakeholders with whom to consult. FAO and GEF worked with local government agencies, commercial fishers, artisanal fisher-folk and local NGOs to support their capacities to plan and implement a whole ecosystem approach to management of these resources. In the Chimborazo area of Ecuador, the páramos, a type of mountain tundra ecosystem, is very important to the local indigenous population, who are dependent on these natural resources for their food sources and livelihoods. FAO, GEF, Ecuador’s Ministry of Environment, the Chimborazo Provincial Council and other national partners are working to conserve and manage the biodiversity of the páramos and mountain ecosystems to re-establish and sustainably use the area’s agricultural biodiversity. The project has worked with local communities to construct five modern watershed management plans that meet their needs. It has also helped build local capacities to shear vicuñas for their prized wool. The vicuña is a relative of the llama and native to South America. Their fine wool, which can be knitted into garments, fetches high prices on the market. Vicuñas had all but disappeared in Ecuador. However, in 1988 Peru and Chile helped reintroduce them to this country and now there is a large population roaming Ecuador’s Chimborazo Fauna Production Reserve. Shearing the Chimborazo vicuñas is the first time this had been done in the area. There are many solutions available that need more attention on the world stage: enhancing on- and off-farm employment through policies and actions, investing in food and agriculture, maximizing resource use efficiency, reducing food loss and waste, converting waste for reuse, and protecting, conserving and sustainably using key natural resources that underpin the food system. GEF and FAO have to date helped 4.6 million women and men, through GEF grant investments totaling USD 732 million. To tackle the planet’s most pressing environmental problems, partnerships are essential. As we learn more about the links between food insecurity, the degradation of natural resources, youth unemployment, climate change and other complex global challenges, we know that we need everyone at all levels to be our partners in finding solutions. Issues are not singular. Actions can’t be either. This story was originally published by FAO.